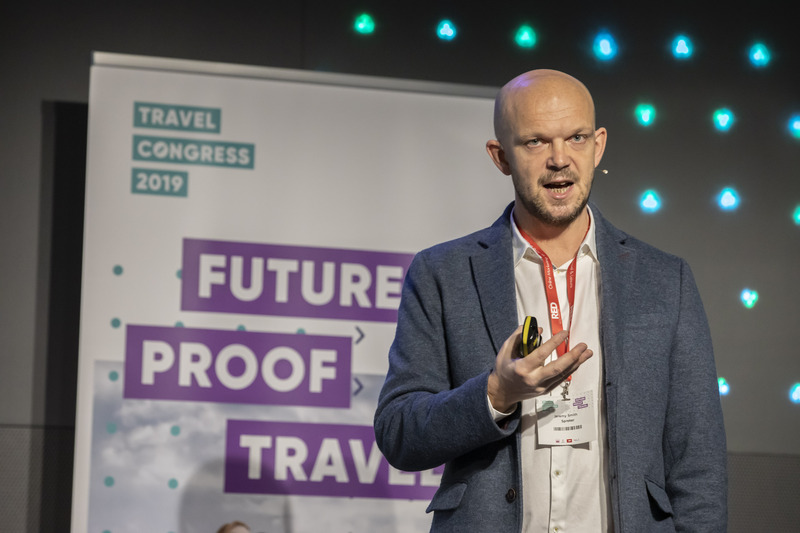 The first edition of the Travel Congress had been kicked-off by an impressive keynote from Jeremy Smith, author of the book ‘Transformative Travel’. During his keynote, Jeremy took us through the transformation of various sub-sectors in the tourism industry. During holidays, many of us tend to get rested by getting more sleep and creating new memories. However, if people want to do this in a more responsible and sustainable way, it also means less balance. In order to fit into this ‘sustainable and responsible’ framework, meat must be cut out of our daily consumptions, people should give up flying and get rid of their cars. Only then people could make a difference and enhance sustainability. Therefore, travel has to be transformed in order to make a difference. Jeremy emphasizes the fact that the words ‘sustainability’ and ‘responsible’ are dead. In order to make a difference, organizations in travel should begin with thinking of how they can redesign tourism and make it part of their story. If the travel industry will not put effort and energy in transforming their operations, within 25 years the energy usage will be doubled, as well as the land usage. Next to that, within 45 years the water usage will be doubled and by the year 2030, 50% more international trips will be taken which leads to an additional 36.000 planes operating within 20 years. Those numbers are worrying if the travel industry continues as usual. If we are doing less harm it has shown that the impact is not enough. It reduces the impact with only 5% each year. 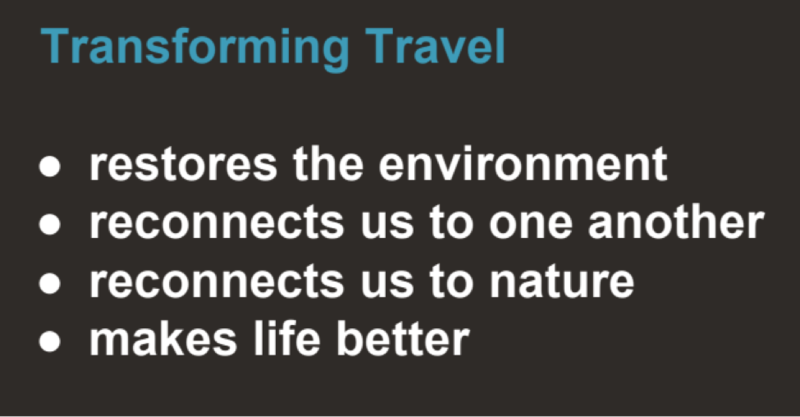 Therefore, we must start NOW with transformative travel: the industry must re-design the tourism field in such a way that it transforms travel, leading to restoring the environment, connecting the humans together and to nature. Life-changing holidays will become the new responsible travel in order to make life better. 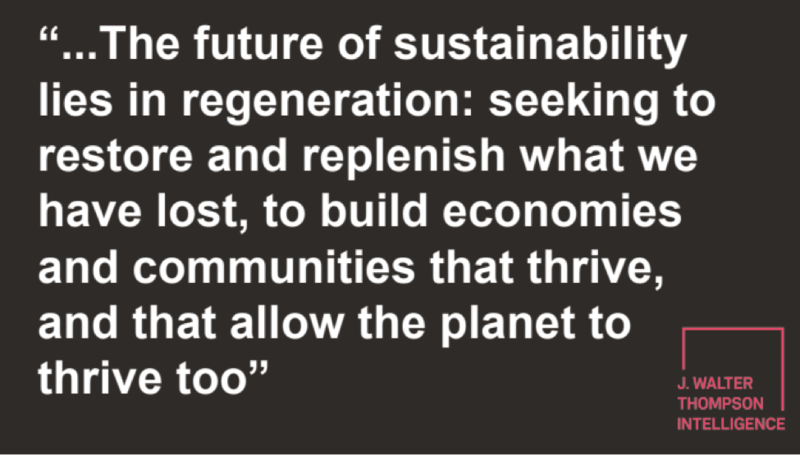 Books and articles such as Drawdown: the most comprehensive plan ever proposed to reverse global warming by Paul Hawken and The New Sustainability: Regeneration focus on the future of sustainability and how to decarbonize the economy. Reversing, restoring and making things better are being seen as effective pillars. Organizations outside tourism such as IKEA and food chains already created concepts and plans to fight climate change. They are providing climate positive products such as the climate positive burger, a climate positive carpet and a climate positive business. Their operations and creations of products need to return a climate positive impact on the world. Concepts in travel should also be developed in order to work on climate positive products and to make life better. Currently, there are already many examples that focus on decarbonization. Food waste is a very important topic nowadays and is the 3rd most impactful harm to the climate nowadays. Organisations aim to minimize the amount of food that gets wasted. RESQ is a mobile application that supports hotels and restaurants in Helsinki to take responsibility to treat their food well and do not let it get wasted. Those organisations can sign up to this app when there is food left from a service shift in order to sell products to local people who are also signed up to the app for a reduced price. Next to that, there are multiple restaurants in London for example that have a changing menu, based on the availability of the food that is left. Those concepts should be enhanced in order to minimize the negative impacts of food waste. Loyalty schemes in hotels are famous for the upgrades for example. Martins hotel took the loyalty scheme to a greener level: instead of receiving loyalty points when you buy specific products, the customer will receive loyalty points when choosing for a more sustainable option. In this way, the hotel encourages their visitors to have a green stay while the visitor will also be triggered to return due to their received points. When it comes to green ways of transportation, Bologna has started an initiative by creating an app that rewards users that make use of ‘green vehicles’ such as bikes. The app is called Bella Mossa and registers your way of transport, gives you points and rewards you with extras at local shops and restaurants when it shows that you have been traveling in a green way. Entertainment apps are also being created for a better cause for safari animals. Guests are being taken on safaris by local tour guides. As safari animals are being threatened nowadays, the organization has created an app which the guests can use: they have to spot the safari animals, the rarer the animal, the higher the score. This leads to a safari trip with high value: guests want to take the trip and get the highest score as possible, which results in less harm to the animals by the local village in order to enhance the experience for the guests. In this way, more money will be generated from the trips which can be used for the development of the local village. In Thailand, 100 miles South of Bangkok, organic tourism and organic agriculture is being supported. A hotel situated in this area makes use of the onsite organic farm and produces fresh products. There are 80 local farmers involved in this project by following an extensive training program in order to learn how to grow organic food. Now that the organic farm is up and running, a network of buyers has been the results of this successful project. Many collaborations with restaurants and hotels were established and all of them are making use of the freshly produced products of the organic farm. Furthermore, local schools are also involved in the project as they will also get taught how organic farms are operating. Lastly, guest tours are also being organized now in order to bring everyone back to the basics of the organic gardens: guests, staff, locals and students are meeting at the local farmer market to learn more from each other’s stories. 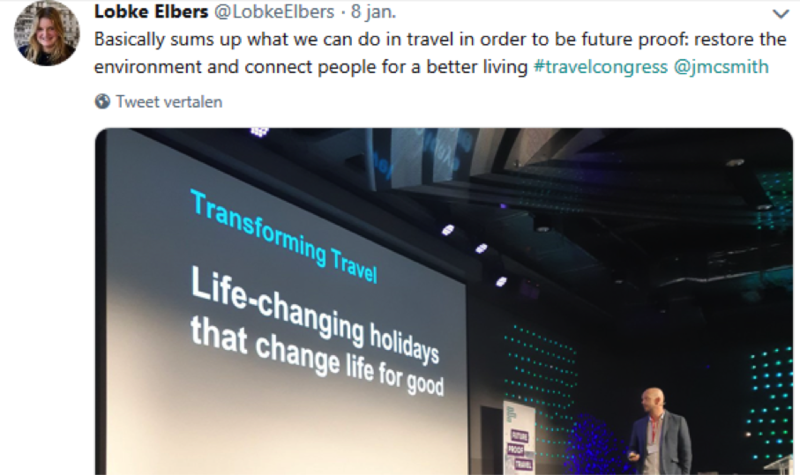 Connecting people in tourism in order to make life better also has to deal with aiming to create a positive impact in reducing climate change. In Hammond, the first bus charter has been set up in order to reduce the number of cars that will drive into the national park, gives the opportunity to people who would normally not be able to visit the park to actually go there now and manage the overcrowding. When it comes to changing the minds of people in order to deal with climate change, Jeremy came up with several examples which focus on ‘trust one another’ and ‘make life better’. 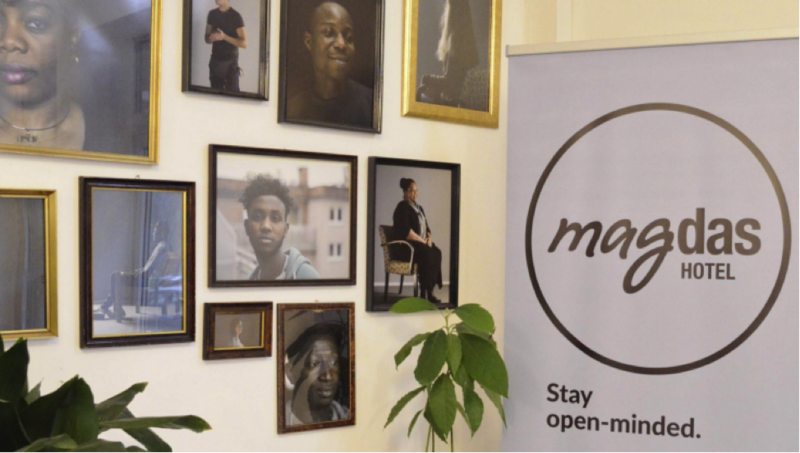 Two third of the hotel staff from the Magdas Hotel in Vienna has a refugee background. The hotel has chosen to work with multiple nationalities in order to create more opportunities for both the staff and the guests who are staying at the hotel. Twenty different languages are spoken which gives room for the staff and for the visiting guests to learn more from one another, their background and historical stories. Next to that, the employees will all bring different skills, talents, languages and cultural backgrounds which results in a special and unique position in the hotel market. Another example of reconnecting people together and trusting one another is the organization of local and historical tours in the conflicted countries of Palestine and Israel. Creating those tours for visitors of the destination leads to hearing authentic stories, visiting unique sites, participate in a responsible way but most importantly is that the visitors have experienced true tourism. An interesting example that Jeremy explains is the model of TOMS shoes: if someone buys a pair of TOMS shoes, the organization offers a pair to someone who is not able to afford them. This model has also been redesigned for tourism purposes. It gives the opportunity to African people to also become a tourist in their own country. They will get to experience their own country through the eyes of a tourist. People and families with a small financial budget must also be able to experience the holiday feeling. The Dutch organization ‘Steunpunt vakantie participatie’ (supporting holiday participation) creates an impact by providing small holiday trips to families or children and let them visit the beach. They will see a wave hitting the sand often for the first time by participating in those trips. It showed that offering those short trips to people created an amazing time. One of the biggest needs when going on holiday is the reduction of stress, get restored and get reconnected. Jeremy shows several examples of natural parks in Finland which focuses on hiking activities that support stress-management by being surrounded in natural silence. However, one of the hardest challenges is to get people excited about this kind of redesigned and responsible travel in natural surroundings. Hohe Tauern health is a responsible tourism brand which creates restored holiday trips which have resulted in guests having improved health, just by participating in responsible tourism activities and at the same time also enhance the protection of nature. Furthermore, the visitor numbers increased to up to 21% and also attracted health professionals and improved the life of locals. It has resulted that if deeper well-being needs are met, tourists will stay longer, come more often to those kinds of reconnecting destinations and they would spend more money. Concluding his keynote, Jeremy Smith recommends tourism businesses to stimulate life-changing holidays that change life for good. Next time people come back from holiday, they will say ‘it was life-changing’. By Lorainne van Liere, involved in the project communication of the Next Tourism Generation Alliance, a European funded project which focuses on creating a future-proof tourism industry based on minimizing digital, green and social skills gaps in 5 tourism sub-sectors: hospitality, food and beverage, travel agencies and tour operators, visitor attractions and destination management. Also, a tourism fanatic, looking for digital innovations and ideas to implement in the industry.